Today in science: The main themes for today’s lesson were “soil formation” and “decomposition.” Rather than what happens to plant materials when they fall off of a living tree, today’s topic involved exploring what happens to dead animal bodies. 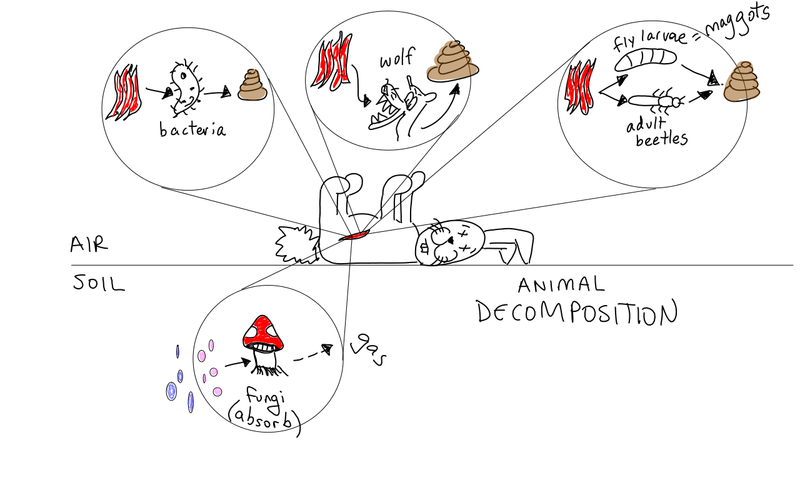 The dead rabbit drawing Dr. M created to illustrate the animal decomposition process in class can be seen below. The notes that go with this drawing are accessible by going through the Notes Portal. A reminder to all students: it was announced at the start of today’s class that the SOIL UNIT TEST will be on Thursday, 6 December. Homework: Any students unable to complete the dead rabbit (animal decomposition) drawing–AND the notes that go with it–in Monday’s science class have been asked to complete it before their next science lesson. Today in science: In preparation for the Soil Unit Test first announced at the start of yesterday’s lesson, Dr. Merritt unlocked a Test Review Portal, which contains a study guide in the form of questions and a vocabulary list, and introduced students to a series of carefully structured writing exercises for students to complete both in and out of class over the next 7 days (see Google Slides document below). Dr. Merritt’s model paragraphs are still available to you within the pages of the Notes Portal. Today in science: During class, students used the 4-layer writing process to revise and improve their ideas about one physical weathering topic, Abrasion – Glacier (#4), and one chemical weathering topic, Oxygen (#1). Today in science: During class, students used the 4-layer writing process to revise and improve their ideas about two biological weathering topics: Plant roots – Physical (#1) and Plant roots – Chemical (#2).